Event alert: The Unmutual and Quoit Media are hosting a special event at Elstree Studios to celebrate Patrick McGoohan (co-creator of the iconic series, The Prisoner). 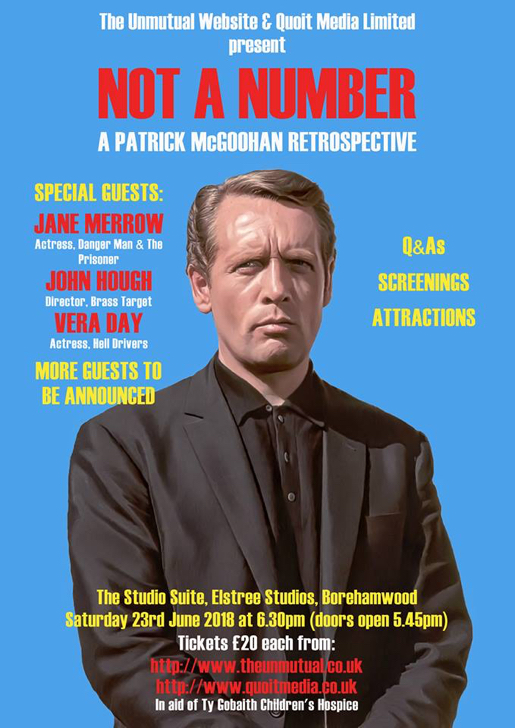 Not A Number: A Patrick McGoohan Retrospective will take place on Saturday, June 23rd, at Elstree Studios in Boremhamwood. Special guests will include actress Jane Merrow (Danger Man, The Prisoner/"Schizoid Man"), director John Hough (The Avengers, The Champions, Brass Target), actress Vera Day (Hell Drivers), and others. A rare chance to get inside Elstree, see props and costumes, and to hear stories from cast/crew of these 60s classics. Tickets and info here. From the press release: "Patrick McGoohan is regarded as one of the finest acting talents of the 20th Century. Starting out on the stage, with critically acclaimed appearances in works such as Brand and Serious Charge, he became Britain's highest paid television actor appearing as John Drake in ITC's Danger Man series before he co-created, starred in, and produced The Prisoner series - a landmark in TV history, still loved, respected and examined 50 years on. Appearing in countless films, stage plays, and television shows, Patrick McGoohan is a true TV visionary. The iconic Elstree Studios, where Patrick McGoohan filmed some of his work, including his first ever film appearance in The Dam Busters, will play host to this very special event to celebrate the man, his work, and his legacy. The event has been approved by the McGoohan family. Special guests, including those who worked with Patrick McGoohan, as well as those who have been inspired by his work, will take part in exclusive and interactive Q&A sessions. In addition, there will be official and exclusive screenings, signings, and other happenings, to celebrate the man and his work, including an unmissable display of original costumes, props, and memorabilia from The Prisoner, Danger Man, and McGoohan movies!" More info here. I hope some Spy Vibers can make it. Enjoy! Selected Spy Vibe Posts: The Prisoner Interviews Vol 1, British Underground Press, Interview: Fab4 Mania, Bond Cocktail Book, Bond at Bletchley, Spy Smasher, Spy Vibe Radio: Peter Gunn, Agent Zero M, New Prisoner Comic, Dr. No Villains Edition, Spy Vibe Radio: Danger Diabolik, Dr. No 60th, Oy-Oy-Seven, Spy Vibe Radio (UFO), Cold War Comic Strips, Thunderball Event, Mission to India, Mort Walker Celebration, Peter Wyngarde Celebration, Batman 66 Exhibit, Prisoner Fifty Event, Ian Fleming Publications 2017-2018, Interview: Ed Hulse Pulp, Avengers Audio Drama, Interview: Callan At 50, Interview: Playboys, Spies, Private Eyes, TWA Returns, Spy Vibe Radio 8, Interview: Ryan Heshka, Mid-Century Modern Schulz, Agent Werewolf, Mata Hair Exhibit, Johnny Sokko 50th, Interview: Trina Robbins, Eddie Izzard, The Prisoner Capt Scarlet 50th, Hugh Hefner R.I.P., Jack Good R.I.P., Interview: Shaken Not Stirred, Callan 50th, Spy Vibe Radio 7, The Prisoner 50th Event, Spy-Fi Event, Kaho Aso 007, Two Million, Bo Diddley, Carnaby Pop, Le Carre Events, Billy Bragg Skiffle, Elvis 68, Jack Kirby The Prisoner, Casino Royale Concert, Review: The Prisoner Vol 2, Interview: The Prisoner Essential Guide, Maud Russell Mottisfont, Spy Vibe Radio 4, Batman Gallants, Adam West R.I.P., Village Triangle, Roger Moore R.I.P., Spy Vibe Radio 3, Sgt Pepper 50th, Satanik Kriminal OST, 60s Overdrive, Make Love in London, Spy Vibe Radio 2, Spy Vibe Radio 1, James Bond Strips, Propaganda Mabuse, Interview: Police Surgeon, XTC Avengers, 1966 Pep Spies, Batman Book Interview, Exclusive Fleming Interview, Avengers Comic Strips, Robert Vaughn RIP, UNCLE Fashions, Thunderbirds Are Pop!, Interview: Spy Film Guide, Lost Avengers Found, The Callan File, Mission Impossible 50th, Green Hornet 50th, Star Trek 50th, Portmeirion Photography 1, Filming the Prisoner, Gaiman McGinnins Project, Ian Fleming Grave, Revolver at 50, Karen Romanko Interview, Mod Tales 2, Umbrella Man: Patrick Macnee, New Beatles Film, The Curious Camera, Esterel Fashion 1966, Exclusive Ian Ogilvy Interview, 007 Tribute Covers, The Phantom Avon novels return, Ian Fleming Festival, Argoman Design, Sylvia Anderson R.I.P., Ken Adam R.I.P., George Martin R.I.P., The New Avengers Comics, The Phantom at 80, 007 Manga, Avengerworld Book, Diana Rigg Auto Show, The Prisoner Audio Drama Review.